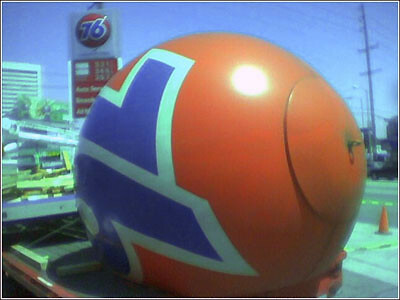 76 Ball fan Marcello Vavala reported earlier this week that there were signs that the station at Santa Monica and Sawtelle might be about to lose its ball. Sure enough, the ball was cut from its pole the next morning, and dragged away to be destroyed. And Marcello shares some observations, to help spot 76 Balls that face immediate danger. Unfortunately, we were not able to organize a protest to try to save this particular ball, but next time we might. PLEASE, if you see a 76 Ball that fits Marcello’s description, drop us a line via our contact form ASAP. Marcello reports: The new signage is up and the orange ball has been taken away. The replacement happened very fast, probably within 5 hours. 1. The ball removal was the last phase of the remodel. If I remember correctly, the station itself received its red color scheme about a full month before the ball was removed. So perhaps that can be a signal for balls that will be removed soon–orange balls at red stations. 2. In this case, there was some site preparation. The area surrounding the pole was taped off–it was apparant that work was going to take place there. But just one day in advance. 3. The actual ball removal happened early in the morning. The pole was down at 8:30am so the work may have begun at 7am, maybe even 6am. Turn Those 76 Balls On! From the before and after pictures, it looks to me that the 76 ball is sign polution. I have no issue with removing the balls.